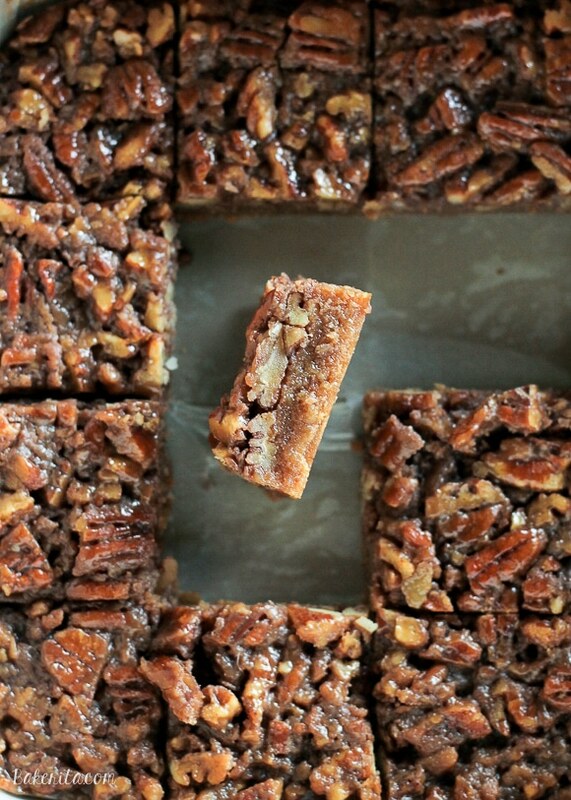 These Pecan Pie Blondies are a portable version of one of my favorite pies! 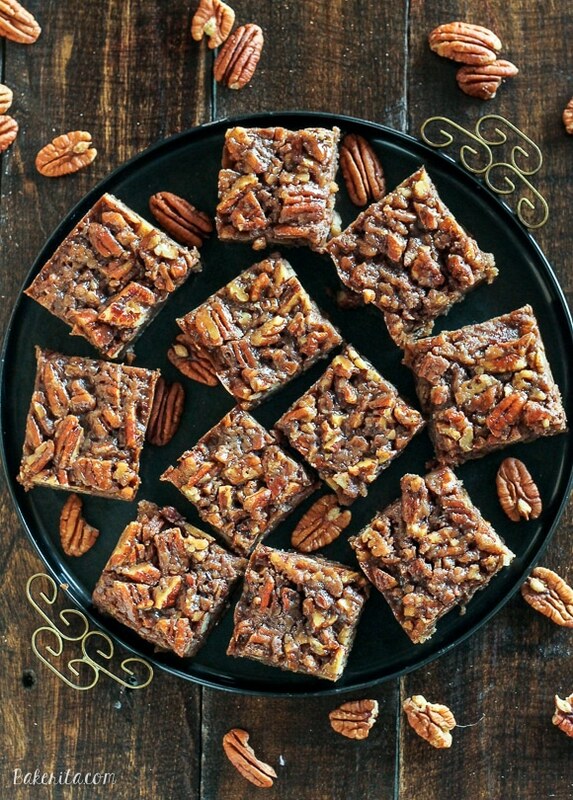 The recipe for these sweet bars makes rich browned butter blondies topped with crunchy pecan pie filling. 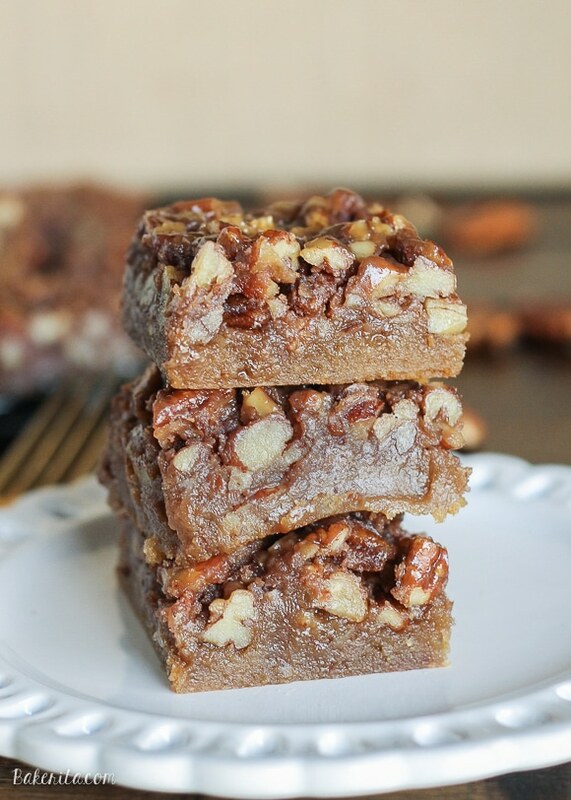 I had planned on sharing a different recipe today, but after the reactions that these pecan pie blondies produced, I had to share them with you as soon as I could, or it just wouldn’t be nice of me. Yesterday, I urged my roommate Ally to try one of these pecan pie blondies, giving her my description: “the brown butter blondie base you love, topped with maple pecan pie filling”. She’s tried pretty much all of the baked goods that I’ve made over the past few years, and so she’s a pretty good judge of comparison and her reactions help me be able to call something absolutely amazing. I don’t know if she was expecting much, but as she took her first few bites, there was moaning and a definite teary eye. I wouldn’t say many baked goods will bring people to tears, but I’d say that gives these a pretty damn high review. She brought them to work with her yesterday (not before setting a few aside) and word is, these also got a BIG thumbs up from her coworkers. They are, I must say, pretty magical. The base of these bars are the brown butter blondies. I love this recipe because it’s a whole bunch of 1s – 1 stick butter, 1 cup flour, 1 cup brown sugar, 1 egg, 1 tablespoon vanilla. Easy peasy. To bring out that toasty, caramelized pecan pie flavor, I browned the butter. It’s such a simple step that makes such a difference in the final product. Brown butter was super trendy for a sec, but in my book, it’s never going out of style because it’s soooo gooood. It makes anything you use it in much more rich and flavorful. The pecan pie layer comes next. I used a mix of brown sugar and maple syrup to give it a little flavor dimension, and the addition of cream helps it bake up to be almost caramel-like. These taste pretty darn similar to pecan pie when you bite into them, except instead of crust, you have those incredible chewy brown butter blondies holding everything together. The pecans add just enough crunch. 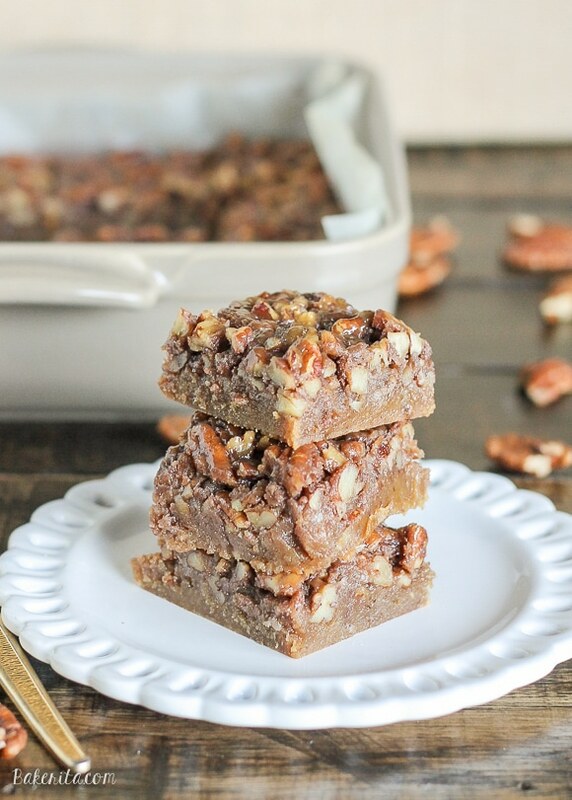 These Pecan Pie Blondies would be a nice departure from Pecan Pie on Thanksgiving if you’re feeling a bit non-traditional, but they’d be delicious any time of the year when you get a pecan pie craving. I know this is a recipe I’ll definitely be making again. Enjoy! Remember to tag #bakerita if you try the recipe. Come hang out with me on Facebook, Instagram, Twitter, Pinterest, and add bakeritablog on Snapchat! Preheat oven to 350°F. Line an 8-by-8-inch pan with aluminum foil or parchment paper and spray with cooking spray; set aside. Place butter in a medium sauce pan and heat over medium heat. Butter will melt, then begin to bubble and foam. Brown specks will begin to form in the bottom of the pan and a white foam will appear on top of the melted butter. Stir the butter very frequently to prevent burning. It should smell very nutty and the butter in the bottom of the pan should have brown flecks in it. This process should take 2-4 minutes. Remove the butter as soon as you see brown specks, remove the pan from the heat and continue to whisk for 30 seconds. Butter can go from being browned and nutty-smelling to burnt and inedible in less than one minute. Transfer butter into large mixing bowl and allow to cool for a few minutes. Whisk the dark brown sugar into the browned butter. Add the egg, vanilla, and whisk to combine. Add the flour, salt, and stir until just combined, taking care not to over-mix. Pour the batter into prepared pan and smooth it lightly with a spatula or offset knife. Prepare the maple pecan layer. Melt butter in a saucepan over medium heat. Once melted, whisk in the brown sugar and maple syrup until brown sugar is dissolved. Bring to a boil, stirring occasionally. Once it reaches a boil, cook for 1 minute and remove from heat. Add heavy cream and stir. Stir in the chopped pecans. Pour the pecan mixture evenly over the blondie batter and smooth the top with an offset spatula. Bake for 30-35 minutes or until the bars are set. Allow bars to cool completely before slicing and serving into 16 squares. I like to refrigerate them before cutting to make them easier to cut. Bars can be stored in an airtight container at room temperature or in the refrigerator for up to 1 week, or in the freezer for up to 3 months. Oh my gosh what an awesome spin on blondies! I much prefer goodies like this for thanksgiving – I usually don’t go for making whole pies! Ummmm, can I bet your roommate?! I would love to get to try all of your baked things. This blondies are simply perfect! Oh wow, my mouth is legitimately watering at these :) Yummmmmmmm! I agree with Natalie! When can I move in? ;) These look sooo amazing, I think I might like blondies more than brownies, and that pecan pie topping looks to die for! Rachel, these DO look tear-inducingly good! That pecan pie topping… Totally calling my name! 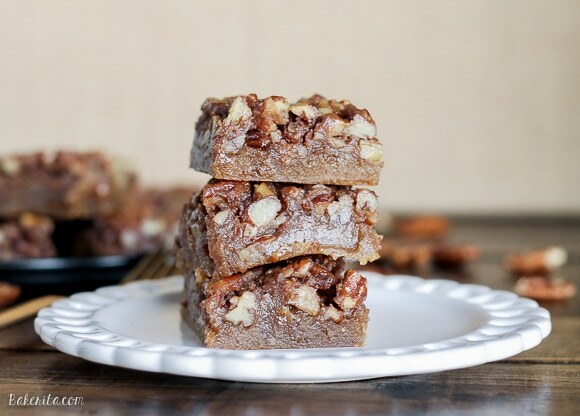 I love pecan pie and I love blondies s everything about this looks mouth watering. And they’re so pretty! Made these for a church potluck today, they were a HUGE hit. Super yummy. So glad everyone liked them, Traci!! I wouldn’t be able to hold back sharing either! These look mega incredible. I love your pics!! These look super decadent! What a great way to shake up Thanksgiving dessert. Thank you Kayle! These are pretty heavenly. It is National Blondie Day today…I think that this delicious “fusion” recipe would be a great way to celebrate!! Are you able to replace maple syrup for honey? If so, would the consistency of the texture be the same? Can’t wait to try this! Thank you :). Hi Tina! You can definitely swap in honey for the maple syrup – the only thing that will be affected is the flavor, and only slightly. Enjoy!